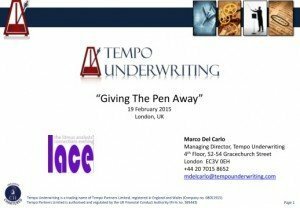 Thursday 19th February saw LACE and Tempo Underwriting pairing to provide the insurance market an insight into delegated underwriting, held by Marco Del Carlo, Managing Director of Tempo Underwriting. With an excellent turnout, the presentation attracted individuals from both the insurance and reinsurance industry and covered the ongoing debate of the effectiveness of Delegated Underwriting, what it seeks to achieve and the advantages and disadvantages. 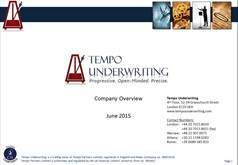 Please feel free to take a copy of the presentation, available below & look out for more events in the upcoming future from Tempo…. !